St Mother Teresa told how one day in Melbourne, Australia, she visited a poor man whom hardly anyone knew existed. He lived in a basement room and rarely opened his blinds. He had no friends. She started to clean and tidy the room in spite of his protests. Under a pile of rubbish she found an oil lamp covered with dust, but she cleaned it and found it was beautiful. He told her he never lit it because no one came to see him. She told him to light it when her sisters visited him. Two of them started to visit him regularly; things gradually improved for him and he kept the lamp alight. You could say that the lamp saved him, but of course it was not the lamp itself. It was the kindness and good it symbolized in Mother Teresa and her sisters. We live in a world darkened by war and violence. All of us have at some time experienced darkness in our personal lives and our families in sorrow, disappointment, illness, pain, sin, guilt and loneliness. At Christmass the goodness of Jesus continues to illuminate the world. The light of Jesus does not come to judge us but to save us. Each of us can be sources of light in a darkened world, but unless our lamp is alight, we will not enlighten anyone else. There is a great joy in being in the light but a greater joy and privilege in being a source of light for others. Let us try not only at Christmass but throughout the year to spread the effects of that light, which are seen in goodness, right living and truth. What kind of personality did Jesus have? The Bible does not say, but it gives clues: crowds flocked to him, children liked him and sinners found hope in him. He was clearly attractive, personable and a reconciler. The important thing is not just Jesus’ personality as shown in the past but his relationship with us now and above all what he wants to do through us. What light does He want me to share in the days ahead? Let us all try to be ever more loving, caring and understanding so that we can be true lights for Christ. A woman was hurrying home from work because it was ‘Bingo night’. She spotted a man holding a placard which read: ‘THE END OF THE WORLD IS NEAR’. “Could you be more precise?” she pressed him. Many people have claimed to know when the end of the world will come. The Gospels give us timely messages about the end, but we should be far more concerned about the end of our individual world at death – which is certain – rather than about the end of the world at the end of time – which is out of our hands. The Gospels remind us that we live in the shadow of eternity and we should try to live our lives each day in such a way that it doesn’t matter when or how Jesus comes – either at our death or in glory at the end of time. The secret is to make each day fit for God. November is the month set aside for prayer for the dead. So what are we doing? Such prayers acknowledge that the dead are still part of the community of faith in paradise. We pray they will experience “the Sun of righteousness with healing in his rays” (Malachi 3 v 19). It is the most natural thing in the world to continue to pray for our departed loved ones, who were not perfect at the moment of their death, but need to experience that full healing and peace which God alone can bring. Second: we pray for the dead at Mass, which is the enactment in time of Christ’s perfect sacrifice on the Cross; that sacrifice is eternally present, so is offered both for the living and the dead. The Church, through the Mass, perpetuates Christ’s sacrifice on Calvary that takes away sins and prays that God will pardon and purify the dead of their sins. So in the Mass we bring before God our departed in prayer in a most profound way. And as we prepare for the end of time, be it at death or the end of the world, the words of St Charles Borromeo come to mind. He was asked what he would do if he was going to die in 2 minutes’ time. He replied: “If I were playing chess, I would make the sign of the Cross and carry on with the game.” In other words, he was content to meet Our Lord in whatever he was doing and that should be our attitude as well. If we maintain that attitude, it won’t matter whether it is before or after Bingo! The Scriptures bring us face to face with suffering, but often that becomes wrongly equated with sickness. In the New Testament sickness is always sickness and never described as suffering; when ‘suffering’ is used it is always for being a Christian and never means being sick. Suffering for the Christian is intended to be a redemptive experience by which we learn the obedience of trusting not in ourselves, but God. Sickness, on the other hand, is always to be healed. Is any one among you sick? Let him call for the elders of the Church…’ (James 5 v 13 & 14). He clearly saw these as different matters to be reacted to in in different ways. We must not confuse suffering with evil; it is not the same. Some suffering may be due to evil, but not all suffering is evil. It is for our benefit that we suffer if we put our hand into the fire – it warns us of danger – a red light with an educational purpose; but not all suffering is of this kind. The world is out of harmony with God and the result is widespread evil of which we are all tainted – and that brings suffering. This can be used well or badly. It can harden a person who refuses to accept it or tries to escape it… or it can be faced and accepted and entered into with Christ and used for his glory. The suffering to which every Christian is called, however, is the suffering which comes when we oppose evil and refuse to have any part in it. This month we keep the feast of St Luke and will have a healing service as usual. Healing is by no means first or only for bodily ailments; we are body, mind and sprit and one of our worst enemies is lack of forgiveness. Resentment imprisons us, cutting us off from other people and sometimes sickness – dis-ease – can follow from this - but forgiveness heals. Whether we are seeking health for ourselves or others we must begin by accepting the forgiveness of God – and we can make the forgiveness of God convincing only by forgiving one another. It is this kind of wisdom and compassion that permeates the teaching of Jesus. We all need to ask ourselves: When did we last pray for those we find difficult to forgive? Harvest Thanksgiving reminds us that not everyone is as fortunate as we are, so calls us to serve others. St Mother Teresa was a firm believer in Catholic teaching, but she did not restrict her ministry to an “in” group. She devoted a lot of her attention to Muslims and Hindus, for as far as she was concerned love was the only goal worthy of attention and the only motive for action. She served with love and though we will not all be called to go to Calcutta, we are still called to serve anyone in need in that same love and without judgement. It is a lesson for all of us, not just for the super-rich, for it is so easy to think only of our own comfort. This man never saw beyond himself and never saw beyond this world. It never entered his head to give his riches away to others. There is no parable which is so full of the words ‘I’, ‘me’, ‘my’ and ‘mine’. This man’s attitude was the complete opposite of true Christianity. Instead of denying himself he affirmed himself and instead of finding his happiness in giving he tried to conserve it by keeping. What makes us rich in God’s sight is not what we own but what we are. Please respond as generously as you usually do with good blankets, clothes & toiletries on 18th September and fruit, vegetables and tinned food on 25th September. In August we celebrate our Patronal Festival - i.e. the festival of the Saint to whom our church is dedicated – the Assumption of the Blessed Virgin Mary. What do we celebrate? On that day we are rejoicing at Mary’s Resurrection, the resurrection which Jesus has promised to all his disciples and which has already taken place in the very special case of Mary, his Mother, who has a unique relationship with him. The Bible does not describe Mary’s death or burial. John’s vision in Revelation Ch. 12 of the woman clothed with the sun, standing on the moon and with a crown of 12 stars provided the scriptural basis for Mary’s Assumption. It may be compared with the resurrection of the body described in 1 Thessalonians 4 v 17, where Paul speaks of those who are alive at the end of time. They will, he says, ‘be caught up in the clouds together… to meet the Lord in the air,…. and will be with the Lord for ever.’ This language is symbolic and figurative, as any language must be in dealing with such a mystery, but it expresses the underlying and stupendous reality. Mary in her Assumption has already experienced fully what we will experience at the end of time. This feast challenges us; we will one day die and stand before Christ (2 Timothy 4 v 8). Are we living our lives so that we are ready to meet the Lord now? Do we pray for a happy death? This feast invites us to prepare with hope and confidence in God’s mercy at the moment of our death. For the next few months the Church is in the ‘green season’ – the vestments and altar frontal are green, which is a symbol of growth. We have just had a Confirmation and Baptisms, which were occasions of great celebration, but it is essential for both our candidates and ourselves to continue to grow in faith. “Take my life and let it be consecrated Lord to Thee… Take my silver and my gold; not a mite would I withhold,” but how much do we really mean them? B is for Bed that won’t release me. D is for Dinner that I must prepare. ….and so our excuses go on. Yet all of us need to be as totally committed to following Christ as we were at Baptism and Confirmation, when we were anointed with the oil of Chrism. That signified our service to God and His confirmation or strengthening of us to enable us to carry out this service. How easy it is to slip to the level of that card: saying one thing but doing another. Yet what we really should be doing is growing in faith. “Why didn’t you tell me that before?” retorted the irritated hiker. Each of us walks at a different pace in our spiritual journey, but the greater our commitment to daily prayer, the Sacraments – particularly Holy Communion – and reading & absorbing Scripture, the more likely we will journey into a deeper realisation of God’s presence in our lives. ​I pray that this aim may become a reality during this ‘green season’. In this Gospel Jesus shows himself to be ‘the friend of sinners’. The Pharisees tried to have nothing to do with sinners and Simon, the Pharisee in whose house Jesus was having a meal, was shocked; not only that Jesus allowed a sinner to approach him but also to touch him. St Luke contrasts the cold reception Simon gave Jesus with the warm reception of the sinful woman. What Jesus was saying to Simon in his parable of the debtors was that this woman, in spite of her sinful past, was nearer to God than he was. In Simon’s mind the woman was beyond redemption. As far as he was concerned she was a sinner and would always be a sinner and he didn’t want anything to do with her. For the woman, however, it took great courage on her part to even enter the house of a Pharisee or come up to Jesus. She became vulnerable and laid herself open to the possibility of public condemnation and shaming. She was painfully aware of her sin and was sorry for it – and Jesus assured her she was loved and forgiven. Here was a woman who recognised her own sinfulness but was thirsting to be recognised as a person and not as an object. What does this Gospel say to us in the month of June – dedicated to the Sacred heart of Jesus – that symbol of God’s tremendous love and complete forgiveness? There is no saint without a past & no sinner without a future. All our sins are but a handful of dust thrown into the ocean of God’s love. So often in the past the Church has made God’s love the handful of dust and our sins the ocean! ​One day a friend paid a visit to Michelangelo and found the great sculptor chipping away at a huge block of marble. “What in heaven’s name are you doing?” the friend asked. “I saw the angel in the marble and carved until I set him free,” Michelangelo replied. If we follow Christ we, too, must ‘release the angel’ imprisoned in all people – including ourselves. The Archbishops of Canterbury and York have asked all Anglican congregations to pray for the evangelisation of this country from Ascension Sunday (8th May) to Pentecost/Whitsun (15th May) that all may come to know Jesus as Lord. Mary is a woman of stillness, silence and contemplation; it is she who “stored up all these things in her heart” (Luke 2 v 52). Silence is a healing influence, for we live out our lives against a background of noise and activity. It may have been tempting to the apostles to become caught up in activity straight away, but Jesus said to them: “Stay in the city until you have been clothed with power from on high.” (Luke 24 v 49). I hope many will be able to take advantage of this time of silence, pray “Thy Kingdom Come” and clothed with the power of the Holy Spirit, like Mary, become more confident witnesses for Christ in the world, so that all may come to know him as Lord. To my surprise there was a rush to the confessionals with priests having to ‘direct the traffic’! People came away, some weeping with joy that they had shed a load of sin and were reconciled with God. Can I accept that I am worth looking for? – For here is the core of my spiritual struggle against self-rejection, self-contempt and self-loathing. It is a very fierce battle because the world and its demons conspire to make me think about myself as worthless, useless and negligible. God’s forgiveness is unconditional and comes from a heart that does not demand anything for itself, a heart that is completely empty of self-seeking. It demands of me that I step over that wounded part of my heart that feels hurt or wronged. On Easter Sunday morning when Mary Magdalene visited the tomb of Jesus and found it empty, she assumed someone had stolen his body. When Simon Peter & John heard Mary’s story, they ran to the tomb. Peter saw the burial clothes but John saw more; he not only saw, but he believed. If someone had stolen the body, surely they wouldn’t have taken the trouble to strip it first and then roll up the burial clothes! Several people saw and touched the Risen Christ. I believe that the diversity of minor detail actually testifies to the truth of the Resurrection. If it had all been concocted, the disciples would have made sure that their evidence was exactly the same! The lives they lived afterwards were also compelling testimony to the fact that Jesus was no longer dead, but alive again. Early Christians were more concerned with the meaning of the Resurrection and much more about Jesus who, through his Spirit, is alive in the world today. We need to discover afresh the power of the Resurrection. It wasn’t enough for Peter to have been told about it by Mary Magdalene; he had to discover it for himself, or he would never have really believed. We, too, have to open our hearts to the Risen power of Jesus. The Good News of Easter is that nothing can defeat us any more – not pain, sorrow or even death. The Good News of Easter is that Jesus will work a miracle in our lives if we will open our hearts to his Easter power. Mary Magdalene, Peter and John came searching for Jesus and we in turn search for him. Our prayer at Easter is that we want to know more of Christ and the power of Resurrection Life. We can show God’s love to others most of all by warm hearts that continually experience the forgiveness and mercy of an all-loving God. May we, like St John, who saw and believed, open our hearts to others and radiate the Risen life of Jesus. HAPPY EASTER!! Lent is a very special time of preparation for Easter. ‘Lent’ comes from an old English word for Springtime – a season when new life comes from the clutch of winter. It is our time for revival and renewal. Maybe you are carrying personal wounds that have been eating away at you. Lent is a time to let healing begin. It is a time to experience prayer anew. It is less a time for pain and punishment that it is a time for healing. Giving alms (donating money to charity or church) .. is it a gesture of love…or to show off about my generosity? Prayer: is it an expression of our love of God and other people… or a means to win approval? Fasting: does it express some sorrow for sin… or is it done simply to let others know how holy I am? Historians tell us that stone-carvers of the most famous mediaeval cathedrals never signed their art. They preferred to work anonymously - solely for the honour and glory of God. This, together with the words of Jesus about not making a show of what we do, invite us to question our motives for working, giving, praying and fasting. How can I witness to my faith this Lent without appearing arrogant or self-righteous? 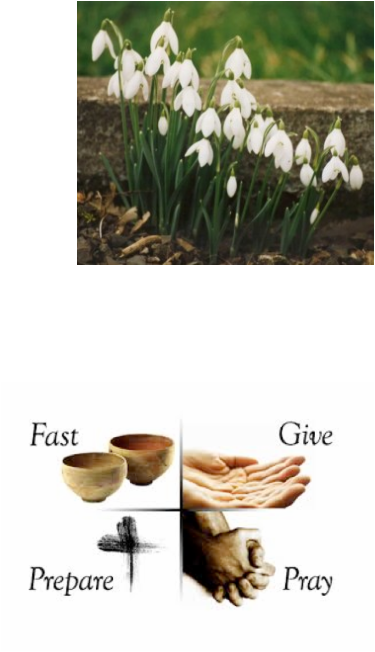 What practical application can I give to prayer, fasting and almsgiving this Lent? ​If we try to live this Lent in this spirit, we will go some way in fulfilling the words of the prophet Joel: ‘Come back to me with all your heart’ and more fully experience the joy of the Resurrection at Easter. ​Our Lenten giving will be for the Additional Curates Society which promotes vocations to the priesthood and helps parishes which cannot afford to pay for a priest. Boxes will be available in church. The word ‘Epiphany’ means ‘revelation’. Sometimes on a dull and wintry January day a break appears in the thick layer of cloud and we get a glimpse of a radiant sun – but all too soon the break is covered up and the sun disappears once more. But that short glimpse of a brighter and warmer world can do wonders for us. Daily life is full of little ‘epiphanies’ if we have eyes to see and minds to reflect as they each slip through the cracks of our busy lives and bring a moment of peace, beauty and goodness. On the Feast of Epiphany (celebrated on 3rd Jan this year) there was a mysterious parting of the veil which enabled the Wise Men to catch a glimpse of the radiance of the Christ child at Bethlehem. Some people looked at Him and saw him as just another child. Others, such as Herod, saw Him as a threat, but the Wise Men paid homage to Him as they recognised Him as their Saviour. All these people had the same eyes, but they did not see the same things with them. It was faith which enabled the Wise men to penetrate the veil and see the reality beyond. Yet the veil closed for them, too, as the star disappeared and they had to return home. What difference did the experience make for them? In one sense it made no difference as they had to go back to their old lives and occupations. However, in another sense, one would like to think it made a world of difference to them. They now had a new vision and hope. For them, the Epiphany had been one of those moments, like a flash of light, that illuminated their lives. In other words we see our divinity in the Christ Child. We may not have gold, frankincense and myrrh to offer, but as a result of knowing Jesus we are able to open the treasures of our heart and share them with others.